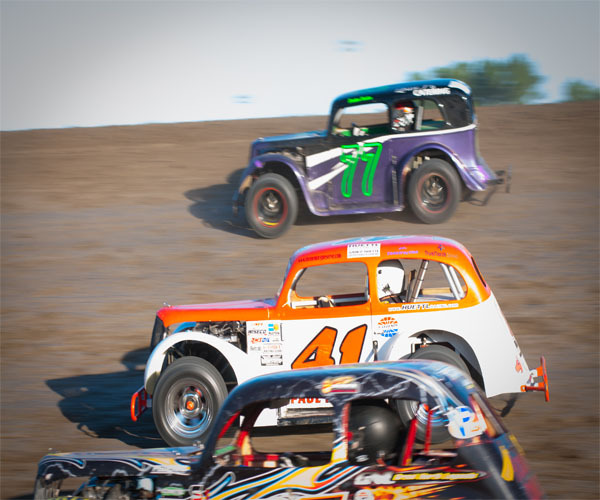 The weather was perfect for racing for the Mid-Season Championships on Friday, June 14th at the Dacotah Speedway. 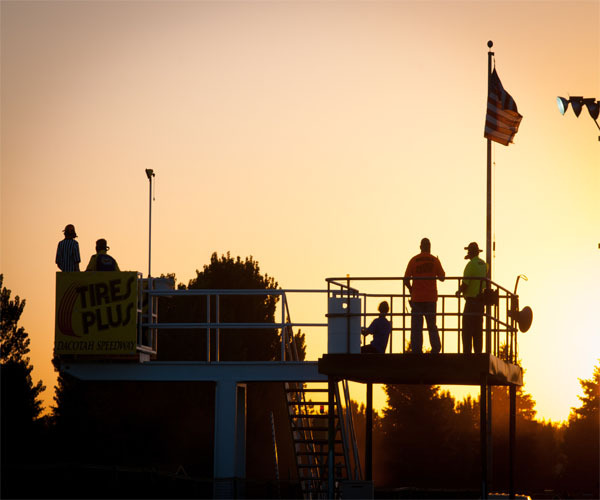 Fans filled the stands as 114 drivers and their cars hits the high banks for some intense, side by side racing. After a short intermission, an IMCA Modified concy started the night. Only the top four from the ten lap shootout would transfer to the feature. Bradley Steffes, who started fifth, quickly took the lead from pole sitter Quentin Kinzley. Kinzley, who had a poorly handling car lost second to Jerad Thelen. 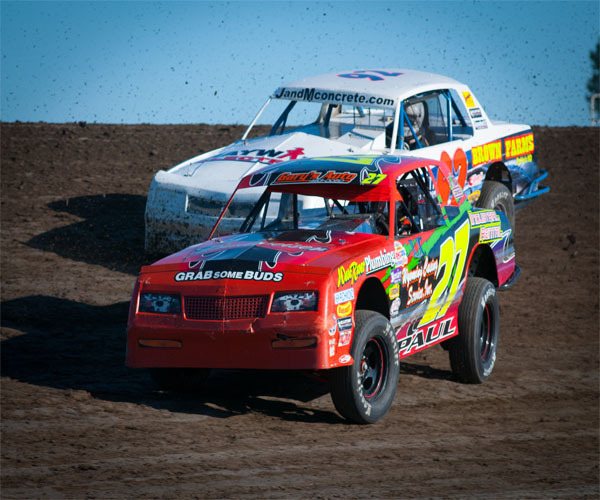 The fast car of Thelen quickly caught leader Steffes before Steffes over drove turn four and spun on his own, bringing out the first caution of the race. Thelen inherited the lead and had to hold off a strong Spencer Wilson. The two drivers raced hard for the lead but Thelen managed to distance himself from Wilson. With three laps to go, Steffes who worked his way back to the front, passed Kinzley for the fourth and final transfer spot. Steffes would transfer to the finish behind Brent Schlafmann, Wilson and concy winner Jerad Thelen. 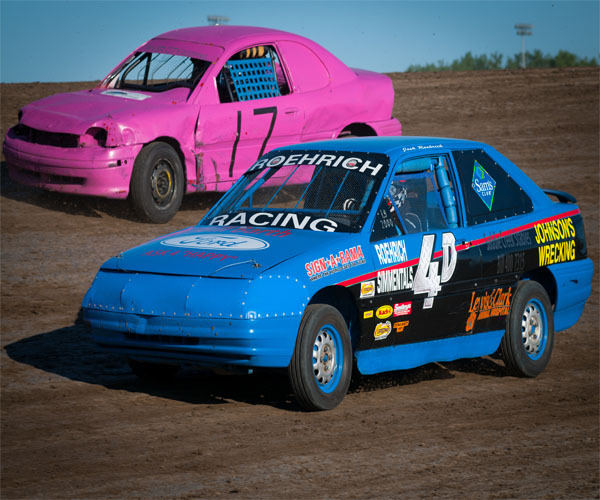 Dylan Thomas and James Weber started on the front row of the Hobby Stock feature. However, it was young gun Aaron Aaseth who would steal the lead away from Thomas on lap two. Aaseth didn't have much time to pull away before points leader Chad Hausauer drove his way to the front and caught leader Aaseth. They briefly raced side by side before Hausauer took the lead on lap seven. A caution with six laps to go regrouped the field behind Hausauer and on the restart, Hausauer failed to start, bunching up the drivers behind him, bringing out another caution. Lucky for Hausauser, he got his spot back but had to hold off Dana Welder on the restart. Welder drove low and took the lead but over drove turn four and spun himself out. Hausauer retook the lead and went on to win the feature and the Mid-Season Championship. Aaseth held off Wishek's Brent Vetter to finished second as Jeremy Engelhardt finished fourth and Shawn Welder rounded out the top five. The WISSOTA Street Stocks hit the track next with Kelly Hoerner on pole. Shawn Volk grabbed the lead on the start as Hoerner quickly lost spots to Hunter Domagala, Jeremy Schmidt and David Falkenstein. As Schmidt and Falkenstein battled for third, they caught second place Domagala. Schmidt and Falkenstein passed Domagala and the two drivers reeled in leader Volk. It was a three wide battle for the lead when Brad Kadrmas took it four wide. Falkenstein sacrificed valuable track position and lifted to avoid a caution, dropping himself from third to fifth. Volk, Schmidt and Kadrmas continued to battle for the lead until Schmidt shuffled into the lead on lap eight. The first caution of the feature came out with 11 to go but Volk held strong in second, holding off points leader Kadrmas. However, Kadrmas was too strong and passed Volk with nine to go. Kadrmas and Schmidt raced door to door for the feature win as Volk lurked in third. As they came out of turn four, the drivers raced side by side but it was Schmidt by half a car length over Kadrmas. Kadrmas's second place finish was enough to clinch the Mid-Season Championship. Volk finished a season high third place over Eric Paul and David Falkenstein. The veteran Ivan Sailer took t he lead early in the INEX Legends feature. Sailer's lead was short lived as Flasher's Troy Hoff stole the lead away on lap two. A lap four caution allowed Steven Kuntz to challenge for the lead on the restart. Hoff blocked Kuntz's drive down low which caused Kuntz to lose his momentum and letting Drew Papke and Shane Williams to blow by. Papke and Williams caught leader Hoff and the three drivers raced three wide for the lead. Hoff got loose racing out of turn four, dropping out of the top ten. Papke and Williams raced hard for the lead with four laps to go. Williams kept digging in the low line until he took the lead with two laps to go. The veteran Sailer who led lap number one tried to retake the forth position from Zach Lutz but the Burlington driver held off Sailer to finish fourth. Paul Huettl finished third behind Drew Papke and feature winner Shane Williams. Donavin Wiest's eighth place finish was enough to hang and win the Mid-Season Championship. 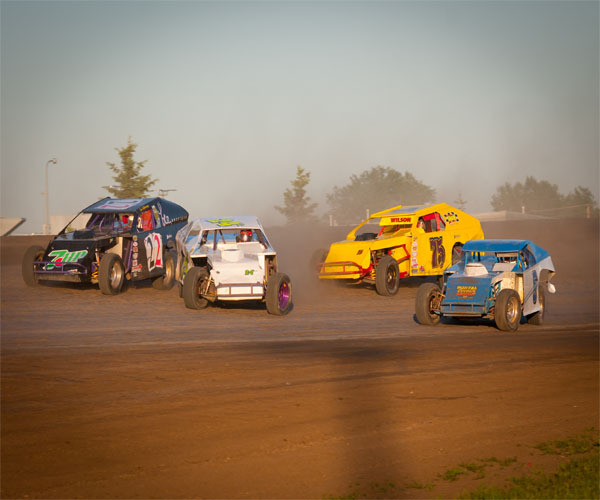 It was three wide between Travis Ulmer, Brian Swensen and Travis Olheiser in the IMCA Modified feature. Swenson led the first couple of laps before a strong Mark Dahl took the top spot on lap five. 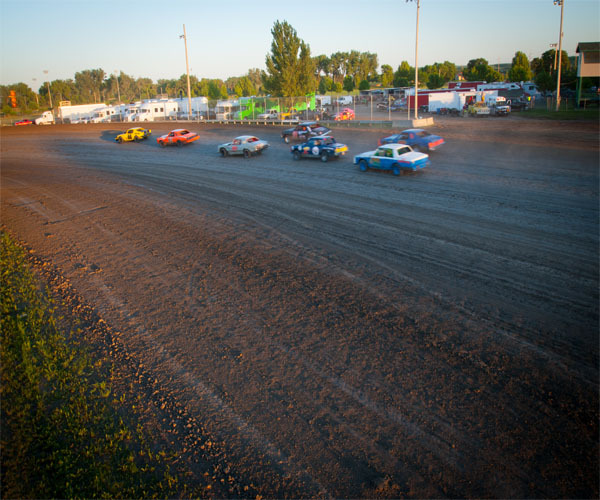 Drivers Shawn Strand and Jeremy Keller, who were tied in the points standings, quickly drove their way to the front, picking off Donald Robinson, Darrell Bauer and Brian Swenson. With 11 laps to go, Strand and Keller battled for second place. As they raced side by side, they slowly caught leader Mark Dahl. Strand challenged Dahl for the lead before taking the lead with eight to go. Keller quickly passed Dahl for second and continued to race in Strand's tire tracks. A caution with five laps to go was the last thing Strand wanted to see. Strand and Keller battled side by side for the win but it was Keller's high line that gave him the momentum to take the lead with three to go. When Tracy Domagala spun with two laps to go, it set up a green-white-checkered restart. Keller held onto the lead to win the feature and the Mid-Season Championship. Robert Hellebust snuck by Strand on the restart to finish second. Brian Swenson finished fourth ahead of Mark Dahl. The IMCA Sport Compact feature finished the night. Rookie Nic West started on the pole, along side Chance Seelye of Regan, ND. West held onto the lead but it wasn't long before last season's track champion, Derek Nitschke caught him. Leader West over drove turn two, giving up the lead to points leader Nitschke. Nitschke pulled away and led the final seven laps to win his second feature of the season. Jamie Schlafmann finished a distant second place. Josh Roehrich, who celebrated his 24th birthday at the track finished third and Nylee DiMeo held off Michelle Stoxen to finish fourth.